High Voltage Software surprised a lot of E3 show goers with the company’s mature themed FPS, The Conduit. This shooter brought some very impressive graphics and multiplayer features for the Wii, as well as one of the most customizable interface and control setups outside of PC gaming. All of this tech and more has been rolled in to the firm’s follow-up FPS, The Grinder, which High Voltage showed behind closed doors. Thankfully, we had the key. My first glimpse of The Grinder was of a landscape straight out of the Midwest. The guided tour allowed me to absorb the finer points of the title before being overcome by the fast and furious gameplay. Graphically, The Grinder is more refined than The Conduit thanks to added development on High Voltage’s Quantum3 engine, which continues to shine with bump-mapping and shadow capabilities that were apparent in the textures and details. After being handed the Wii Remote and Nunchuck combo, I was met by a vast horde of vampire bat-like creatures. The revised engine can handle far more bad guys than Conduit, which enabled swaths of these angry creatures to lust for my blood. The smooth and accurate controls allowed me to dispatch the horde with well-placed shots and a few fiery grenades. Well, they weren’t all well-placed, as I survived the incoming mauling largely due to a tactical use of exploding barrels. The Grinder implements plenty of destructible environments into its level design, with breakable tables, chairs, boxes and other vanity items awaiting their demolition. While this may not be something to tout when compared to Red Faction: Guerrilla‘s mayhem, this is very impressive for the Wii. 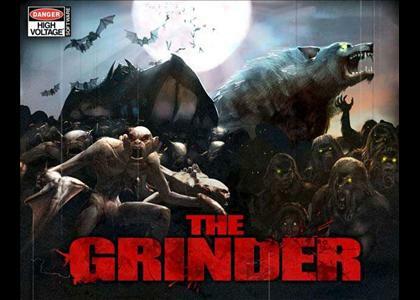 Behind the technological innovations, The Grinder is a solid game described by the developers themselves as their Left 4 Dead. 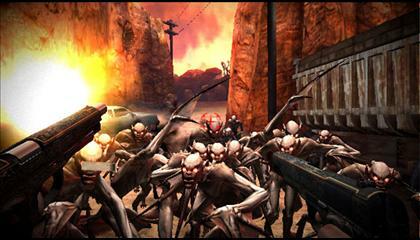 The game embodies the style of Valve’s zombie opus right down to the Grindhouse visuals, grainy film overlay, and drop-in four player multiplayer coop. Unfortunately, the coop and promised character upgrading system were not implemented in the build shown. Upon reaching the end of my demo session, I came across the title’s last surprise of the day: a fearsome mini-boss mob that took more than a few shots to bring down. Neither developer would go into detail on the presence of other bosses, but I was told that we can expect some "challenging encounters" throughout the title. The game will offer numerous mob types to destroy, as we aren’t just fighting a zombie apocalypse here. The technological innovations heading to the Wii from HVS’s Quantum3 engine are hard to miss. At this time, we were told that Wii MotionPlus support is "still being played with" for possible inclusion. If the development team can implement a deeper, more meaningful story into this mature-themed title, The Grinder will provide gamers with a full package that would be hard to pass up. The Grinder is currently scheduled for release in 2010 exclusively on the Wii.